Recent advancements in DNA sequencing have made enormous contributions to understanding the biology of life forms. Reduced cost and increased speed of DNA sequencing have led to rapid growth of genomics. Functional significance of genomic elements (DNA, RNA, proteins, small molecules and phenotype) are still being unravelled in each organism. This workshop will provide an introduction to Next Generation Sequencing (NGS) technology, platforms, data generation, and data analyses. Lectures will be delivered by experts in the area of genomics and bioinformatics. Practical sessions will be conducted using real data. 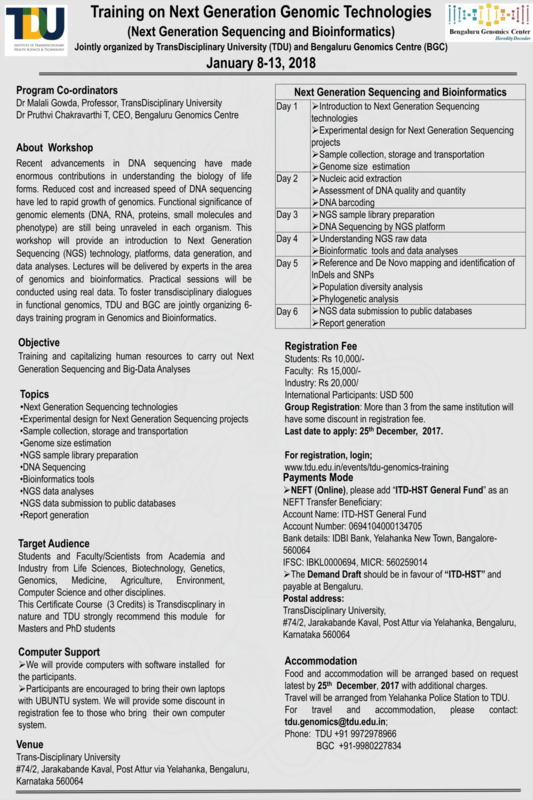 To foster transdisciplinary dialogues in functional genomics,TransDisciplinary University (TDU) Bengaluru and Genomics Centre (BGC) are jointly organizing 6-days training program in Genomics and Bioinformatics. Listed on 13 Dec 2017.